Specify the desired administrative rights for the selected unit. Select the Support Accounts to link in the Tools section. 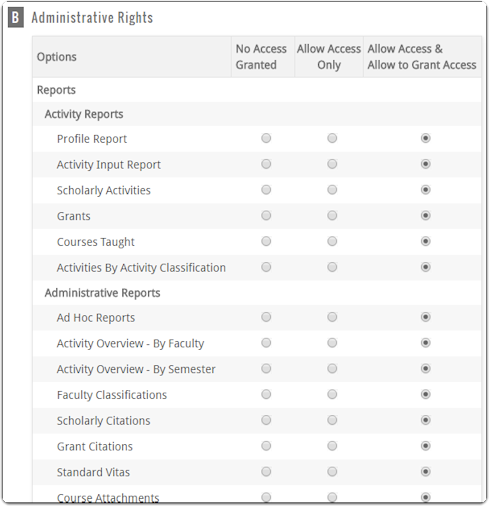 While editing a support account with limited rights, individual faculty accounts can be selected in Section D (as displayed above). The support account user would have access to just emulate the faculty account but not have access to any other administrative rights for the unit. Faculty Accounts - (Add/Edit) Faculty: There is no option to set 'Limited Rights', but this is currently being considered for future development. Report on data entered into any section enabled for the Profile Form. Report on data entered into various activity input templates for any enabled section, excluding the default Scholarly Contributions & Creative Productions section. Report on data entered into the default Scholarly Contributions & Creative Productions section. Grants Report on the default Grants section by funding or count. Courses Taught Report on the courses taught that have been entered. Activities by Activity Classification Report on an activity classification data across multiple input sections. Ad Hoc Reports Build and create your own report with the options available. Activity Overview - By Faculty Report on selected activities from the Activity Input Form and break the results down based upon organizational structure and faculty appointment. Activity Overview - By Semester Report on selected activities from the Activity Input Form and break the results down based upon organizational structure and academic term. Faculty Classifications Report on faculty members’ controlled classifications for selected academic terms. Scholarly Citations View scholarly citations by organizational structure and faculty appointment. Grant Citations View traditionally styled grant data by organizational structure and faculty appointment. Standard Vitas View/export a vita that was administratively configured for a given faculty member for selected academic terms. Course Attachments Report on attachments associated with courses taught. Prior Activity Input Forms View activity input forms that have been submitted by faculty members or were approved as snapshots. Evaluations Access evaluation reports at the unit level. Custom & Accreditation Reports Report on any accreditation reports or custom reports available for the specified unit. Initiate Faculty Input Workflow Create a link for faculty to input activities for specified academic terms/years. Managing this process centrally is recommended. Approve Faculty Input Review/approve faculty input based on unit level. This is can be a tiered (more than one level) review. Faculty Specify which subunits can manually add faculty members to FACULTY180. Subunits can also be restricted from manually adding faculty members. Courses Add/edit course information (number, title, hours, level, etc.). Course Prefixes Add/edit course prefixes (abbreviation, name, unit assigned). Courses Taught Add/edit courses taught (course title information, enrollment, etc.). Administrative Rights Add/edit administrative rights for users. Evaluation Workflows Create workflows for faculty evaluations. Evaluation Processes Create processes for faculty evaluations. Evaluation Forms Activate/deactivate evaluation forms and faculty classifications forms used in evaluations. Create Input Form Create faculty classification input forms. Input Classifications Assign faculty members to faculty classifications. Upload Data Upload faculty and current positions, courses and prefixes, committees, units, faculty classifications, scholarly outlets, scholarly outlet metrics, and secondary unit assignments in bulk. Backup Data Backup and export system data in bulk. Emulate Users Access features to emulate faculty members in the appropriate unit. Support Accounts Create accounts for staff members and non-faculty members who need administrative access. Search Search faculty data based on words. Email Faculty Send an email message to selected faculty and administrators. Email Faculty Logins Send an email message containing system login information to selected faculty and administrators. Custom Message Post a custom message for selected faculty and administrators on the dashboard. Faculty Classification Form Post a faculty classification form reminder message for selected faculty and administrators on the dashboard. Details Setup foundational areas, including institution name, unit designations, faculty ranks, and academic terms. Locations Setup locations/campuses where courses are taught. Committees Add/edit committees at the unit level. Organizational Structure Select the type of access subunits can have to the organizational structure for managing organizational units. Faculty Classifications Create/manage faculty classifications and forms at the unit level. Activity Classifications Create/manage faculty classifications and forms at the unit level. Program / Course Groupings Create/manage program/course groupings at the unit level. Scholarly Outlet List Manage scholarly outlet lists and related metrics. Access is only at the highest level (level 1) within the institution. Upload Form Upload institutional data (e.g. faculty courses, faculty classifications). Profile Form Configure input sections that remain static over time (e.g. contact information, degrees, credentials, and work experience). Activity Input Form Configure the Activity Input Form at the unit level. Vitas Configure the standard vita at the unit level. Web Services Configure web services to transmit faculty data to institutional web site(s) and other campus systems (e.g. research repositories). API Tokens Configure the API to migrate data to other systems. Access is only at the highest level (level 1) within the institution. FAQ Configuration Create a custom FAQ section for faculty and administrators. To add a subunit to a unit, see Organizational Structure.